It was an honor to be a contributing author to Governance, Natural Resources, and Post-Conflict Peacebuilding and serve as a Founding Member of the Environmental Peacebuilding Association, which is focused on developing, managing, and sharing knowledge on environment, conflict, and peace. The Volume on Governance, Natural Resources, and Post-Conflict Peacebuilding was launched in Washington D.C. in 2016 and the series was produced in partnership with the United Nations Peacebuilding Commission, United Nations Environment Program (UNEP), Environmental Law Institute (ELI), University of Tokyo, and the Specialist Group on Armed Conflict and the Environment of the IUCN Commission on Environmental Law. Governance, Natural Resources, and Post-Conflict Peacebuilding is one of six and is part of a global initiative to identify and analyze lessons in post-conflict peacebuilding and natural resource management. The project has generated six books of case studies and analyses, with contributions from practitioners, policy makers, and researchers. Other books in this series address high-value resources, land, water, livelihoods, and assessing and restoring natural resources. Special thanks to Carl Bruch and everyone else who made this volume possible, along with the publication of our chapter, Environmental Governance and Peacebuilding in Post-conflict Central America: Lessons from the Central American Commission for Environment and Development. I’m particularly grateful for my co-authors’ contributions; Carlos Manuel Rodriguez, Marco Antonio González Pastora, and Mauricio Castro-Salazar. Mr. Rodriguez serves as Minister of Environment for Costa Rica. Mr. González Pastora and Mr. Castro-Salazar formerly served the Executive Secretariat for the Central American Commission on Environment and Development. The forward to this volume was written by Costa Rica’s former President, Óscar Arias Sánchez and focuses on negotiating peace agreements, implementing humanitarian assistance, and developing legal frameworks relevant to post-conflict natural resource management. The core question for all contributing authors was: What is good governance? Contributing authors responded by assessing how governance can best address the cultural, social, economic, and political dimensions of post-conflict environments. If you’re interested in purchasing a copy of the volume, you can buy it here. When the guns are silenced, those who have survived armed conflict need food, water, shelter, the means to earn a living, and the promise of safety and a return to civil order. Meeting these needs while sustaining peace requires more than simply having governmental structures in place; it requires good governance. Natural resources are essential to sustaining people and peace in post-conflict countries, but governance failures often jeopardize such efforts. 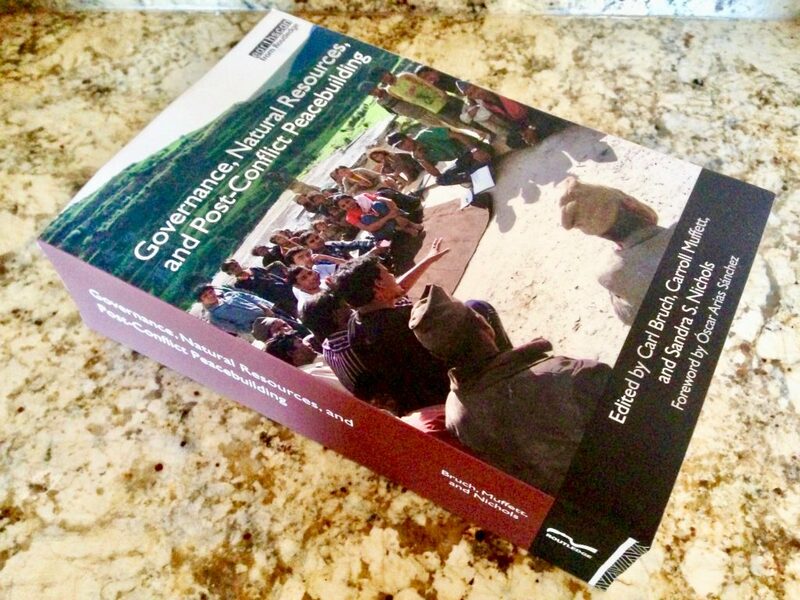 This book examines the theory, practice, and often surprising realities of post-conflict governance, natural resource management, and peacebuilding in fifty conflict-affected countries and territories. It includes thirty-nine chapters written by more than seventy researchers, diplomats, military personnel, and practitioners from governmental, intergovernmental, and nongovernmental organizations. The book highlights the mutually reinforcing relationship between natural resource management and good governance. Natural resource management is crucial to rebuilding governance and the rule of law, combating corruption, improving transparency and accountability, engaging disenfranchised populations, and building confidence after conflict. At the same time, good governance is essential for ensuring that natural resource management can meet immediate needs for post-conflict stability and development, while simultaneously laying the foundation for a sustainable peace. Drawing on analyses of the close relationship between governance and natural resource management, the book explores lessons from past conflicts and ongoing reconstruction efforts; illustrates how those lessons may be applied to the formulation and implementation of more effective governance initiatives; and presents an emerging theoretical and practical framework for policy makers, researchers, practitioners, and students.